Overseas tourists visiting Goa loves to spend their leisure time by playing golf. The premier hotel chains that operate in Goa are aware of the fact that such tourists love to indulge in golfing. 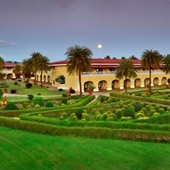 When it comes to golf resorts near Goa, there are four popular names in the list- The Leela Goa, The Taj Exotica, The Ramada Plaza and The Intercontinental. Among these four, the Grand Greens Golf Course in the Intercontinental is a mass favorite as it has been designed keeping in mind the need of both beginners and experts. Other opportunities available in these resorts include swimming and interesting games. 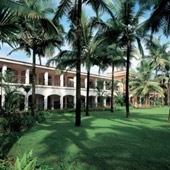 A 5 star resort, The Leela Palace is nestled on the southernmost tip of Goa amidst 75 acres. 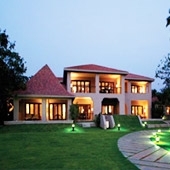 The resort offers sea view rooms, a bustling fishing village and a lush green golf course. A Mediterranean style 5 Star Resort, Taj Exotica, set amidst 56 acres, offers 140 rooms & suites overlooking the sea. The hotel features a 9-hole mini golf course and a 3-hole pitch golf course. Nestled alongside Varca Beach in Goa, Ramada Caravela Beach Resort features tastefully designed rooms overlooking the garden, pool and sea from balcony. The hotel has a fitness centre, a tennis court and a golf course. 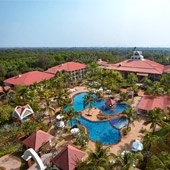 Located 3 kilometer away from Palolem Beach, The Lalit Golf & Spa Resort features an 18-hole golf course, spacious suites, rejuvenating spa and 4 restaurants serving Indian and international cuisines.